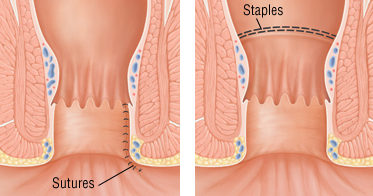 Sutures, commonly called stitches, are sterile surgical threads that are used to repair cuts (lacerations). They also are used to close incisions from surgery. Some wounds (from trauma or from surgery) are closed with metal staples instead of sutures. Sutures may be used to close surface wounds or deep wounds. To close a deep wound, a doctor may need to sew the two edges together layer by layer, placing and leaving some sutures under the skin surface.